Looking for a new spin on chicken salad? 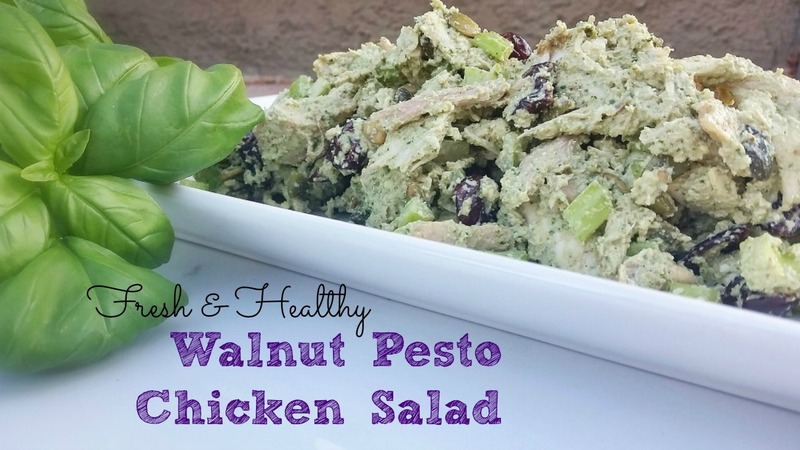 Try this enormously healthy walnut pesto chicken salad! Compared to the typical mayo-laden chicken salad, this one tastes 1,000 times better and is 1,000 times better for your health. Why? We have the walnut to thank. Walnuts are the only nut rich in alpha-linolenic acid (ALA). It’s a polyunsaturated fat that is only found in plants. The human body does not manufacture this important nutrient, so we must be deliberate in making sure our diet provides an adequate amount. 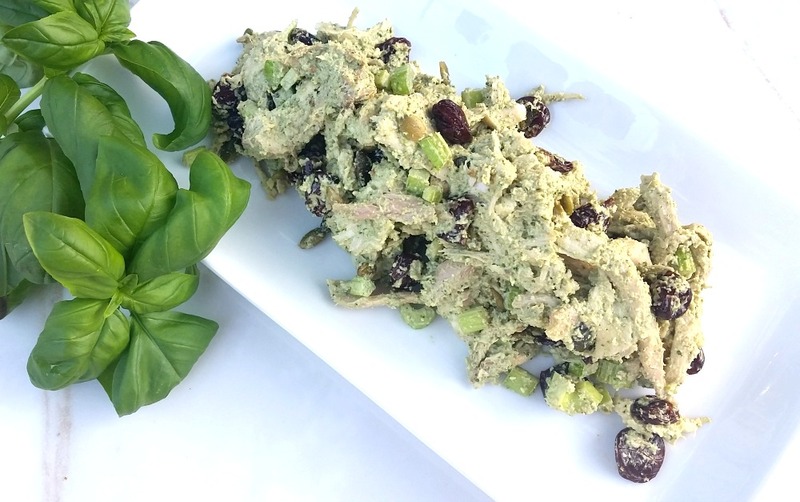 Adults need 1-2 g of ALA/day, which can easily be met by eating 2 servings of this walnut pesto or a serving of the walnut pesto chicken salad. Just 1 oz of walnuts contains 2.5 g of ALA! Yes, I get quite excited over super healthy foods! Your body can use ALA to form EPA and DHA, other omega-3 fatty acids. There is no reason to take supplements when you can easily meet your needs by eating healthy, delicious recipes like this one. In my book, there’s nothing more satisfying than something that’s bursting with flavor. That’s what you’ll experience with this dish. The walnut pesto is so fresh and light, but dances on the tongue with garlic, lemon, Parmesan and a heap of fresh basil. Pair it with some chewy, tangy dried cherries and a bit of crunchy celery, and you’ve got the perfect home for some leftover cooked chicken. Looking for a great way to cook chicken breast? 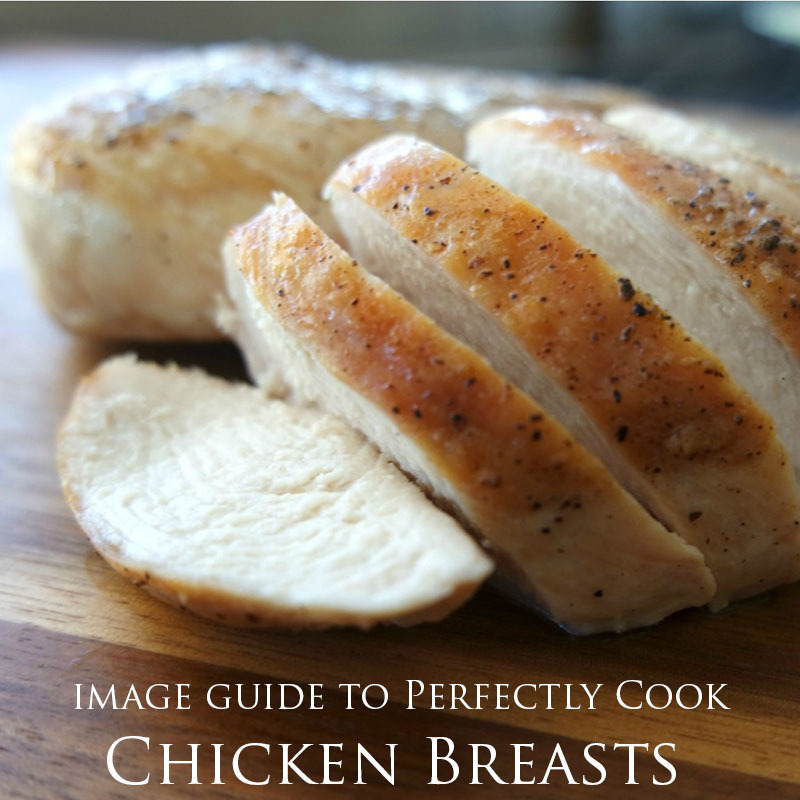 Look no further: An image guide to cooking perfectly cooked chicken. This is an incredible makeover from the boring and bland chicken salad you are used to eating. It makes the perfect light dinner on it’s own or make it more hearty by stuffing it in a pita. Top some spinach or the ultimate cabbage mix with this walnut pesto chicken salad and you’ll definitely want to make this a part of your weekday meal rotations. Nothing could be easier! Make the pesto over the weekend and toss it with some pasta and top it with a perfectly cooked piece of salmon for an amazing meal. Then keep the rest in the fridge to make a quick and easy dinner during the week. Make your dinner prep even easier by making extra chicken the night before, then you can use the leftovers to create an incredibly quick, healthy and satisfying meal. Have I given you enough reasons to swap your typical mayo-based chicken salad for this flavorful, colorful, option? I hope so! You’re palate won’t be disappointed and you can feel good about feeding your family an incredibly healthy meal. A fresh and healthy spin on the mayo-based chicken salad. If you feel it's a bit dry, add a bit more pesto. 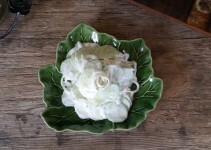 Eat by itself, in a wrap, on some bread or over a bed of greens. See Walnut Pesto Recipe below. 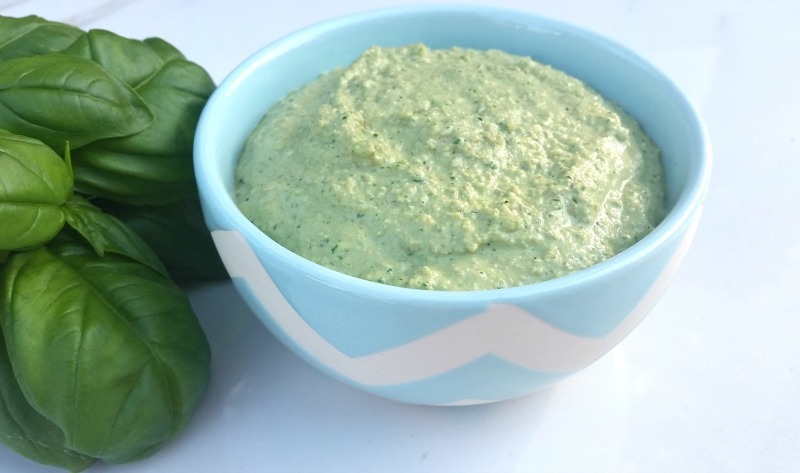 A fresh and healthy alternative to pine nut pesto. Into a food processor, add walnuts and garlic. Blend until chopped. Add basil, yogurt, lemon juice, salt and pepper. Blend until slightly mixed. Scrape down sides. Add cheese and drizzle in oil. Blend. 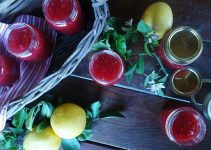 While processing, add water a little at a time until you get a glossy nectar-thick consistency. You may find you need less or more water than 2 oz to achieve this. 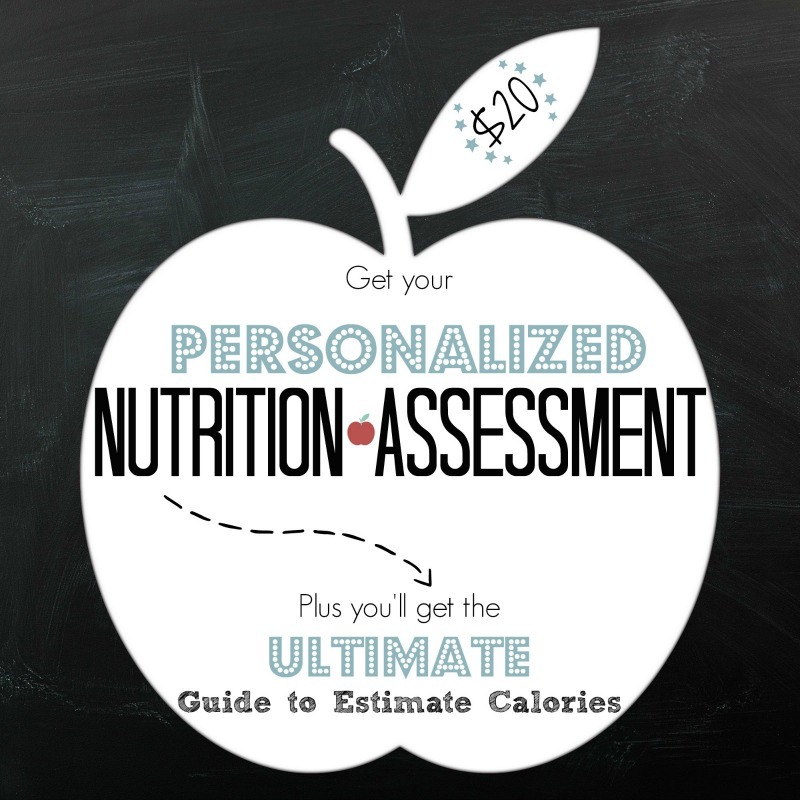 Be sure to pin or save to yummly for quick reference! 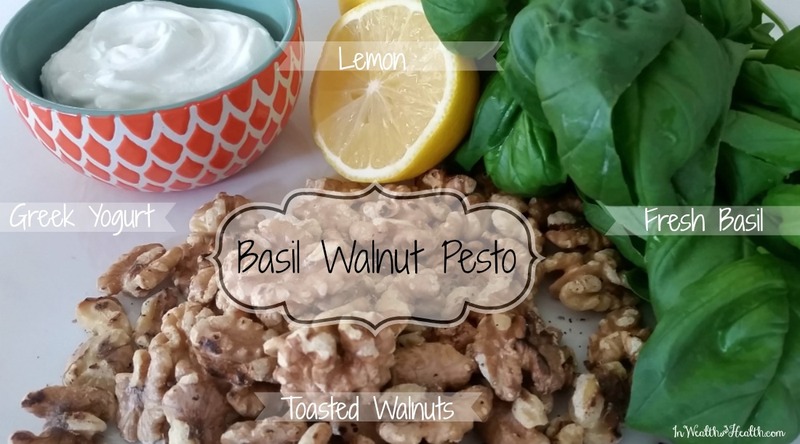 I adore pesto of any kind but I do love making it with walnuts too. Pesto chicken salad is soooo good and now I am craving some! Yum!! I love chicken salads and love the pesto spin you have on this one! Also love the changes to your design. So cute! Wow this looks absolutely delicious! I love chicken salad and this looks amazing! 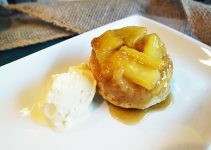 I am SO excited for this recipe! I am a chicken salad lover, but hate the usual guilt that goes with eating it. I looooove pesto, so this is a must make for me! 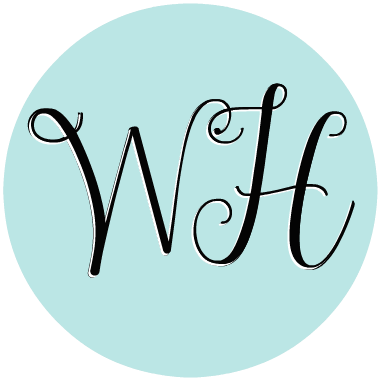 I’m pinning it for later, too! I loved this article and thought you would too. 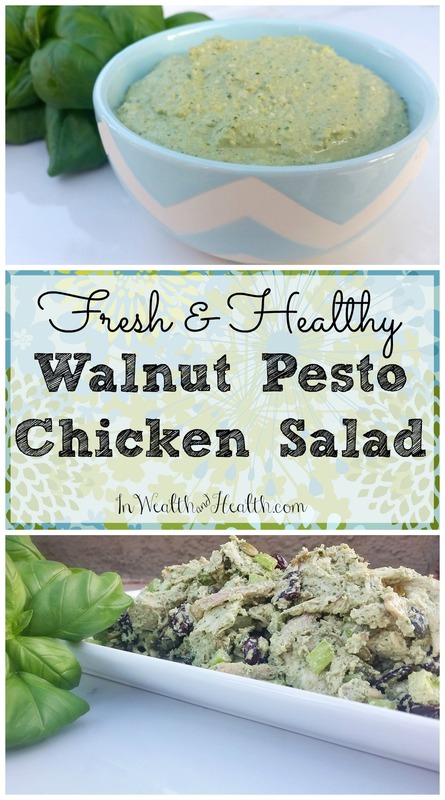 Here it is Walnut Pesto Chicken Salad located at http://www.inwealthandhealth.com/walnut-pesto-chicken-salad/.